(PhysOrg.com) -- Life's smallest motor, a protein that shuttles cargo within cells and helps cells divide, does so by rocking up and down like a seesaw, according to research conducted by scientists at the U.S. Department of Energy's Lawrence Berkeley National Laboratory and Brandeis University. The researchers created high-resolution snapshots of a protein motor, called kinesin, as it walked along a microtubule, which are tube-shaped structures that form a cell’s “skeleton.” The result is the closest look yet at the structural changes kinesin proteins undergo as they ferry molecules within cells. “We see for the first time how kinesin’s atomic-scale moving parts allow it to pull itself and its cargo along a microtubule,” says Ken Downing, a biophysicist with Berkeley Lab’s Life Sciences Division. He conducted the research with postdoctoral fellow Charles Sindelar, now at Brandeis University. “We found that there is a pivot point, where the kinesin motor attaches to the microtubule, which acts like a fulcrum and causes kinesin to rock up and down like a seesaw as it moves along the microtubule,” adds Downing. Their research is reported this week in the online early edition of the Proceedings of the National Academy of Sciences. The first-ever glimpse of kinesin’s seesaw motion offers key insights into one of life’s most fundamental processes. Fueled by an energy-giving compound called ATP, kinesin proteins motor along microtubules like trains on a railroad track, towing cargo to various locations within cells and assisting in cell division. Microtubules are a cylindrical weave of proteins found throughout cells that serve as cellular scaffolding. Until now, scientists did not have a clear picture of what happens when ATP binds with kinesin, and especially how this process triggers structural changes in kinesin that propel the protein along microtubules. 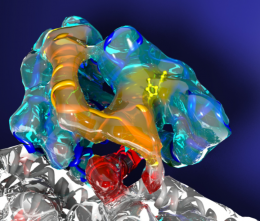 Extremely high-resolution crystallography images of kinesin motors have enabled researchers to piece together the protein’s three-dimensional structure. But these images don’t reveal how it works. “The problem is that it is not until the protein motor binds to a microtubule that structural rearrangements occur that enable ATP hydrolysis, the process that transfers energy from ATP to kinesin,” says Downing. To image kinesin at this critical stage, Downing and Sindelar turned to cryoelectron microscopy, which is a type of electron microscopy in which the sample is studied at extremely low temperatures. The technology is used by structural biologists to image proteins and other molecules as they appear in real-world conditions, in this case a kinesin protein attached to a microtubule. The technique yielded 8 to 9 angstrom-resolution snapshots of the kinesin motor at four stages of the motor’s cycle as it moves along a microtubule. One angstrom is one-ten billionth of a meter. Using these images as a guide, the researchers then “dropped in” even higher resolution crystallographic images of kinesin’s components. This step enabled them to derive atomic-level structural models of kinesin in action. In addition to further elucidating a key biological process, Downing and Sindelar’s research may inform the development of disease-fighting drugs. One of kinesin’s main jobs is moving chromosomes apart during cell division. Anything that blocks this process will lead to cell death, which is the basis of several cancer therapies such as taxol. “New insights into how kinesin works could allow scientists to develop drugs that target and block particular kinesin movements,” says Downing. ..we see for the first time how kinesine atomic-scale moving parts allow it to pull itself and its cargo along a microtubule..